Today's ATL love series takes us to Tucker where my dear friends and Isn't She Lovely blogger Jana Burrow is raising her sweet little family. Jana's blogging is my go-to for uplifting lady talk and real life mom advice. She is also a gifted writer and her post "Inside a Year and a Weekend" really moved me. What you love about your hood: It has a small town feel right next to the big city! We are incredibly close to major highways, but we always feel like we live in a little bubble. The surrounding areas of Decatur and Oak Grove are nearby and we frequent those areas for eating out as well. Favorite breakfast/brunch: Sunday brunch at Marlow's is my favorite. However, Seth loves to take the girls to Old Hickory House on days when he lets me sleep in! While I have only been there once, I look forward to going again! I went because there was a Scout Mob and I was not disappointed. Can't wait to go back. Best working lunch: I don't technically work, so a working lunch for me is Chick-Fil-A so the kids can run around in the play equipment. However, if I did have a working lunch with adults I would go to The Greater Good. I love their sliders, but really you can't go wrong. Usually for a date night we try to get out of Tucker and find something new. But, when we want to stay close to home and have a really yummy meal we head to Shorty's. Seth is a pizza guy and I do not love pizza. They apparently have great pizza, but their menu offers so much more too! I prefer their shrimp fajitas. Best meeting friends for drinks: Local Seven...it's bar food, but great atmosphere! I love that Sweet Dee's is on Main Street. I have never been one to just buy a cupcake, but I find myself unable to resist at Sweet Dee's. Donuts, pie, or ice cream: I struggled with this one because outside of chains there's not much of these around here. So, Seth told me to put his favorite place on Main Street which is Growler Time. Diner, greasy, spoon or grab and to-go dinner: Matthew's Cafeteria. It's pretty historic, and really greasy! Neighborhood Shop or Farmer’s Market: Tucker Farmer's Market (summer only) This farmer's market is really impressive. There's music, food, and fun for the kids. Our routine is to get a King of Pops treat, pet the goat and buy the goat cheese, stock up on veggies, play in the kids area, and head to Main Street for dinner. 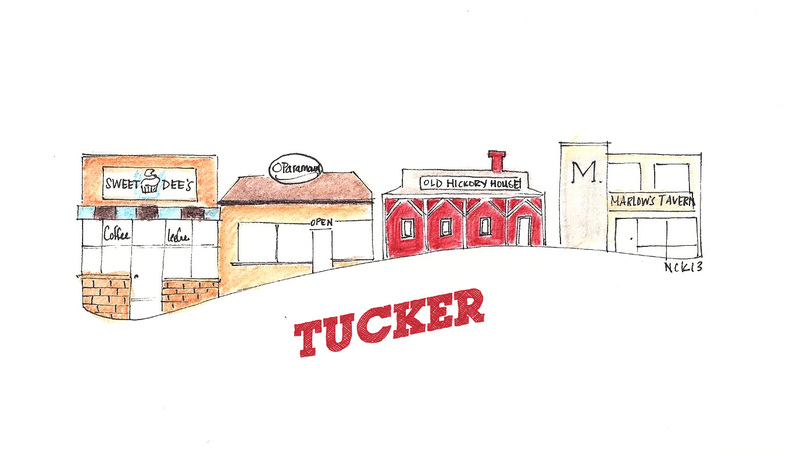 Non-food shopping: Tucker House has all of your boutiquey needs and is just a cute place to go! previous ATL LOVE posts: Marietta|East Atlanta Village| more coming next week..
Love this! I live right down the road from Tucker (and Jana) but of the places she mentioned I've only been to Shorty's. Look's like there are some new places for me to check out. Thanks!! I hope you will check out some of the places - its the reason I wanted to do this series. I get stuck in ruts of where to eat! I'm excited! That you're excited! Thanks for your help. This is fantastic! I love this blog world and the many friends you find along the way. You guys are so good at your own blogs, and also at lifting each other up. Thanks Vicky! I love collaborating with Jana. We have big plans for the future! It looks like I'm going to have to spend more time in Tucker! Great post Janna, fantastic job facilitating Meghan, and I, of course, am obsessed with anything Natalie creates. The only place I've been in Tucker is Cake Art, which is an endless array of caking/baking tool goodness. I will definitely have to hit up some of these other spots next time!